Corega CG-WLUSBNM is a high-gain wireless USB adapter which provides a simple and easy way to add or upgrade wireless connectivity to your desktop or notebook computer. Corega CG-WLUSBNM supports higher data rate of up to 150Mbps when connecting with wireless 802.11n device which is 3 times faster than your normally 11g connection. Supports 64/128-bit WEP, WPA , WPA2 encryption and WPS-compatible. 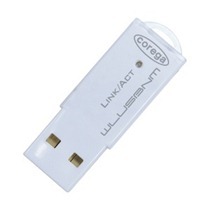 Corega CG-WLUSBNM is based on the Realtek RTL8188 series WLAN USB chipset. You can also use lateset Realtek RTL8188SU series generic driver and software for Corega CG-WLUSBNM.